Everyone downloads a lot of stuff from the Internet. Be it software, videos, music, documents or images, you fill your hard drive with all of this. To track and manage all these downloads is a daunting task, and having a clean workspace to organize all these downloadable contents is the need of the hour. This is where a download manager comes to the rescue, also accelerating your downloads all the way. Let's take a look at some download managers rated in this article. All tests were done on Windows 10, 64 bit system with 8GB RAM running the latest versions of Chrome, Firefox, IE, Edge, Vivaldi & Opera browsers. The ratings are comparative, so when a new download manager is reviewed, the corresponding rating of others might change. After testing around 12 download managers, these are my top 5 recommendations from the list. Read also the Features of Download Managers at the end of this article. The best open-source download manager that works across multiple platforms. Good media capture ability, Private download videos, Refresh link feature to resume download from expired links, Frequent updates with good support, Perfect browser integration, Supports multiple download queues, Extremely good download speeds, Open source & works on all platforms. UI can be improved, Heavy download size. The fastest download manager that even beats its commercial alternatives. Fastest in the tests, Charming drag'n'drop UI, Skins and Themes, Supports BitTorrents, Batch download, Refresh download address, Integration with browsers, 3-way Streaming media download, Multiple queue schedules, Website login manager, Continuous updates. Stability issues, Bundled offer during installation. I've tested these download managers and they fell short of top 5 for various reasons mentioned here but you can still try them out as an alternative. Orbit Downloader won't be reviewed, and users are advised to stay away from it, because not only is the product bundled with all sorts of 3rd party software, it's also classified as malware, as it turns the application into a DDOS tool. More report here at Softpedia. 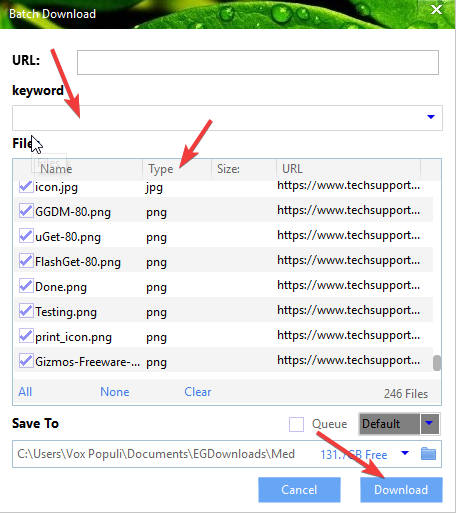 FlashGot allows you to set your own preferred download manager and integrate it with the Firefox browser for auto download. DownThemAll is another browser extension to add advanced download capabilities to Firefox. Video Download Professional can help you download videos from various streaming media sites on Chrome. Resume broken downloads: Downloads can be paused or resumed at will even after computer shutdowns or unexpected power outages, and it'll resume any unfinished download from the place it left off. Categories: Helps to organize your downloads automatically according to their type (videos, music, documents) in different folders and also define extensions to be included in the type. Download Acceleration: A single file is split into multiple sections/segments and then using several simultaneous connections to download each segment from a single server. Queueing: Start the downloads instantly or save it for later, setting up the download in a queue, and define the maximum number of concurrent downloads. Certain download manager allows you to define multiple queues. Scheduler: Start and stop downloads in the queue at a predefined time on a particular day, or synchronize your downloads to run on different days of the week. Additionally you may choose to shut down/hibernate computer after downloading. Browser integration: Integrate your download manager with various browsers and it'll take over the downloads automatically. Additionally clipboard monitoring, will let you capture copy-pasted direct links. Popular browsers like Firefox, IE, Chrome, Opera support is essential. Media grabber: Download streaming video and audio from various sites and even preview or convert them to different types. Batch downloads: Easy way to download whole ranges of files/links from a particular webpage . Also by adding a group of sequential file names of a particular type you can download multiple files from a website. Protocol support: Mainly HTTP, HTTPS and FTP support, also support for RTSP, MMS, Metalink, Bittorrent and RTMP would be a bonus. Export/Import: At times when you want to uninstall/reinstall the program, it's useful to export/import the downloads in the list, so that it'll save you time and extra-work. Inclusion/Exclusion list: Include/exclude various File Types and Websites you want to monitor. Speed limiter: Set maximum download speed for a file and adjust the traffic usage for browsing and other stuff. Proxy/Socks support: Work behind HTTP and FTP proxy-servers. Refresh expired links: Sometimes a download link remains valid for only few hours and if not completed within that time boundary, download fails. Refreshing the link let's you resume these downloads. Virus checking: Check downloaded files with a scanner you've set up to protect users from harmful virus/spyware. Float windows: Indicator to show the current downloads and its status. If you have had a similar experience then you should consider becoming a reviewer too. Ninja is no longer free. US$19 for 1 year. That error is often caused by the downloaded file being corrupted. I wouldn't mind paying for a commercial program that accelerates uploads to mediafire accounts, but can't find one. Can anyone out there help me find an upload manager that I can use to accelerate uploads to my mediafire account? Other than a commerial upload/download manager, I don't know about a software that can do this. There has been an update to EagleGet coming after 6 months, which is 2.0.30. For the time being being, I urge the readers to either stick with v2.0.28 or if you are updating it to v2.0.30 please choose the option for Ads (Don't use my resources) part. I'd definitely recommend the latter part because there are some major bugs resolved in this version. All you would see is a small ad about iNewTab (their extension) on the bottom left of the interface. The installer is reported clean according to VT results. It seems that in the latest version they have added Shared VPN feature (Hola VPN) which basically helps to download videos from proxy sites, to remove region restrictions. To use this feature you need to enable Free (Use my idle resources) part when the pop-up shows up. But with Hola VPN comes the Luminati SDK service. In return for sharing your IP address you get the software witout ads. This is something that I'm not interested in. With this recent development, it shouldn't be the top choice IMO. I never did like EagleGet to be honest. I use Free Download Manager. Am still researching into this. At the moment it's not a big concern. The software is reported clean by VirusTotal. Moreover i installed Glasswire to see what network connections are being shared if I choose the Free (use my resources) option, and except for the IP sharing I dont see any outbound requests. Things could have been bad, but since after installation you get a option upfront to choose what version you like, with clear instructions I wouldn't even call it as bad as OpenCandy. Usually I don't give top picks for adware software, while this is an exception because of it's performance, you can expect some development in the article in a couple of days. Thanks for letting me know about this. Updated the top pick, but the ratings remain the same. That's good to see George :). I have almost done a major update to this review and we've 2 new top picks this time. I've tested 12 download managers for the review and Free Download Manager v5 testing is still underway, the review I'll be uploading this week. The way it stands right now the top 5 has done a really good job. Congrats! I need your input.. Which one of these programs can list and download multiple files of a certain type from a website page similar to downthemall? Hi, this article is undergoing a major update, so the updated list will come out soon. I'm also getting rid of some of the download managers from the list as they haven't been updated for a long time or doesn't fare well in my tests. For your question, you can use the batch download feature in a download manager. For EagleGet just right click on the webpage and then filter the file type as required. Thanks George for the reply. Unfortunately, most batch download feature that I know cannot crawl a webpage, list all possible download links and allow me to filter certain file types. I might be wrong but eagleget's batch download feature does not seem to be able to do what I'm looking for. 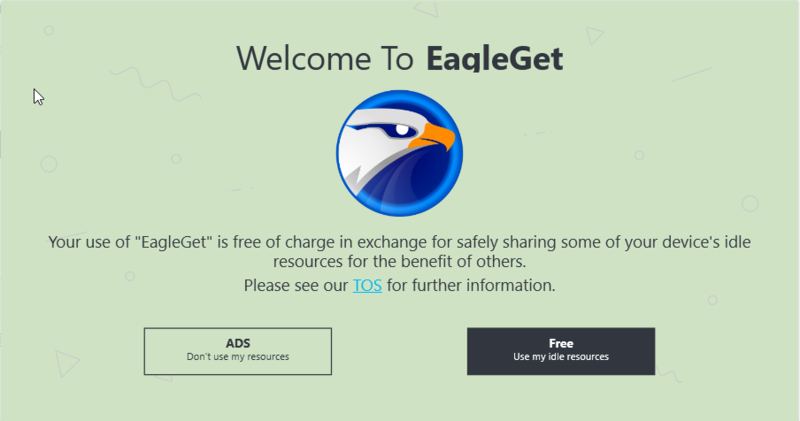 You can't be serious about EagleGet. I tried it. It lasted about 15 minutes on my machine. For starters, the installer shuts down your browser. When's the last time you saw that? Then, unless you're very careful, it will install, not one, but two unwanted add-ons - something called ByteFence and it will also try to change your search engine to Yahoo. I thought that kind of sneakware was not permitted on Gizmo's site! An invasive, difficult-to-understand, poorly translated user interface that you can't easily control with options--I just gave up, uninstalled and went back to FDM with a new appreciation for how good it is. EagleGet has stopped bundling offers in it's installer and it's now clean. Although, it installs an extension iNewTab from the same company into your browser after installation. You may choose to remove it as you like. The setup package is now clean only with an optional opt-out installation of iNewTab for Chromium browsers. I commend the efforts made by the team to remove sponsored offers. I went ahead and installed the iNewTab extension and it is indeed a useful extension. Obviously you did not read the installer warning included with the product details. We include a warning in all our reviews when we are aware of products using wrapped installers or using other potentially unwanted practices. This is such a common occurrence now it is not feasible for us to ban such software from our reviews unless the install process does not have an opt-out for the unwanted items. We also publish information pages to assist users with this process. MC - Site Manager. The older 32-bit Free Download Manager was more customizable and consistent, however the current 64-bit version, 5.1.20.5362, has lost the ability to show download progress, and there is no way to prevent accumulating download history, AFAIK (the setting is ignored). However, Firefox does show the newer version as compatible with Electrolysis (multi-process), though it seems much slower to respond to a new download request than the older version. It's true, new version 5 of Free Download Manager isn't that good. Older was much better in terms of everything. But, FDM 5 is still a work in progress, and they are slowly adding features to it. You can post a feature request on their forum, which they will consider and incorporate in the software. I hope slowly it will be great like the old version. GetRight is a commercial software, and since this is a freeware site, it won't be reviewed here. hi, i have downloaded free download manager, but when i want to download a zip file from google drive, i cant resume the download after pausing it.why do i have this problem? i thought that this app supports resuming. I've not delved deeply into this subject but, going by downthemall's Options box, it has features galore, and its out-of-box convenience [as part of Firefox] is superior to that of separate download managers. [Digression: Mozilla are idiots not to build in such functionality instead of relying on third-party add-on.]. There's just one problem with DTA, that may affect other separate apps too: pop-ups. DTA conflicts with Pop-Up Stopper [freeware]- the latter blocks the former, thinks that DTA is a pop-up. I use a pop-up blocker because most [all?!] free anti-virus apps often bug one with Upgrade offers etc. [and i'm not talking self-closing ones either!]. Seems to be download ninja's website has changed. It redirects to https://vpnscout.org/ninja-download-manager . Maybe the links for download ninja can be updated.